FX-602P Sim is a simulation of the favorite programmable scientific calculator FX-602P, which was produced in the past by a well-known Japanese manufacturer. Its specialty: It is easy to program based on algebraic notation and not RPN. 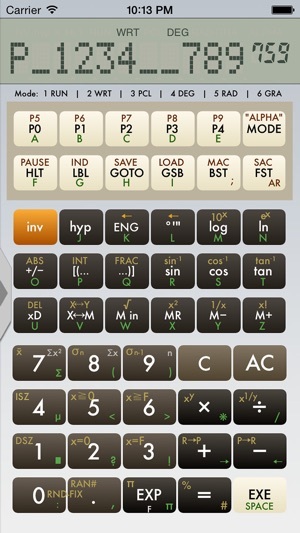 The documented functions and programming-features work like those of the original calculator. 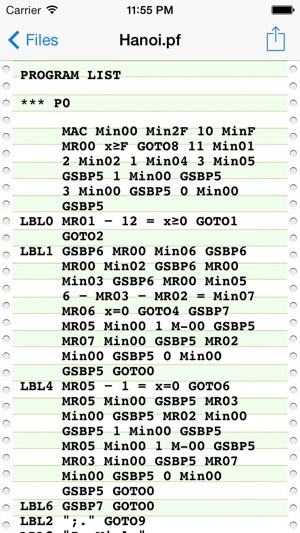 As oppose to the original device the default programming memory of FX-602P Sim is not limited to 512 steps. It has been extended to 999 steps. The default number of registers has been increased from 22 to 110 ("Mode ." is not longer needed). 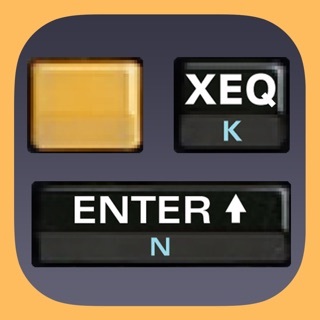 This calculator is not only for engineers and scientists: Whenever you have to do repeated typing of tedious calculation sequences, you can make your life easer by programming them. There are detailed pdf-manuals in various languages easy to find in the internet (keywords: fx-602p manual pdf). 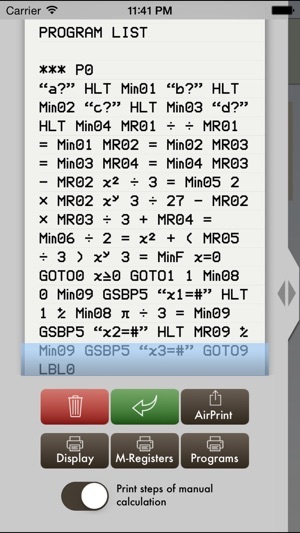 Special registers in FX-602P Sim are M96 to M99. If enabled for date and time, they are read only and provide the local date and time down to the second. Registers M87 to M95 can contain location service parameter like i.e. latitude, longitude and altitude if they are enabled. Programs and data content remain persistent in IOS-devices' memory. ● Save and Load-functions of the cassette interface FA-2 (FA-1) are now implemented. 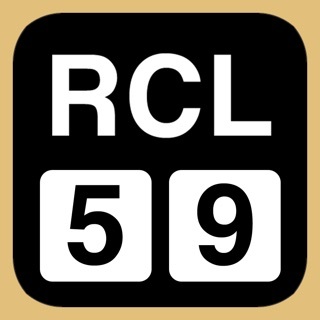 Calculator programs and registers can be stored in files and retrieved from files. The file format is compatible with the FX-602P simulator for other smart-phones, so that programs can run on both simulation platforms. ● Preview of saved calculator files like program listing. 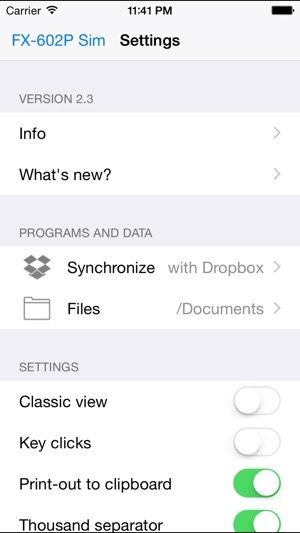 ● Dropbox-Implementation to synchronize the internal calculator-files with the Dropbox filesystem. I relied on it when I was in college. I got mine in 1981. Even programmable! I think it was the most beautiful, natural to use calculator. On eBay it costs hundreds of $$ now. Thank you for bringing back great memories. I had such fond memories of my long lost fx-602P that I had thought about trying to find one on ebay. This simulation brings back the good feelings of what may have been the best value in an elegant programmable calculator. It seems very good so far. 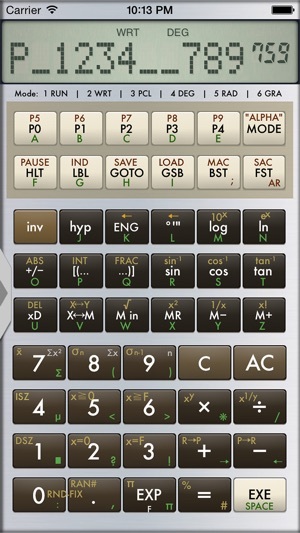 I regularly search for Casio FX-602P to see if my favorite calculator has shown up on the iPhone. This one seems like fairly faithful rendition. Great job. 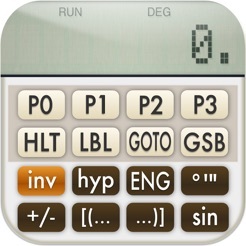 The strong suit of this programmable scientific calculator is its use of algebraic logic instead of RPN.